Cartoon. 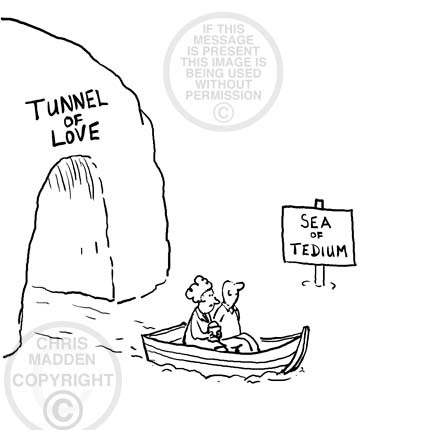 A couple in a boat leaving the Tunnel of Love. The boat enters a vast empty ocean called the Sea of Tedium. A cartoon about the end of romance, the waning of love, unrealistic expectations, romantic delusions, the banality of life, boring partners, declining physical attraction, lovers, marriage, relationships, passion, boredom and ennui. Not a very romantic view of romance really! 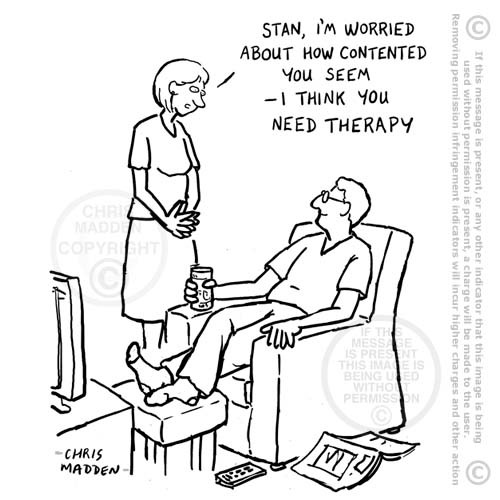 Cartoon about advise on how to live your life. The sort of woman to marry – how attractive should she be? 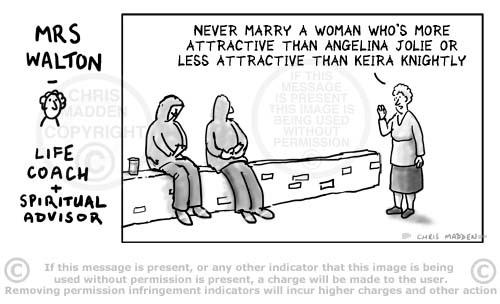 The cartoon shows a ‘lifestyle guru’ telling some young men what sort of woman it’s advisable to marry. 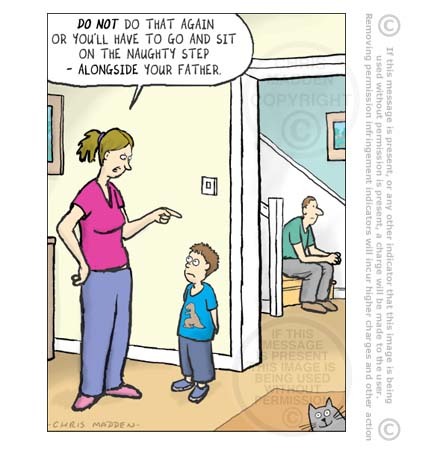 Part of the joke in the cartoon is that the situation depicted is absurd, because the young men are obviously unmotivated members of disaffected youth culture. Marriage is obviously not on their agenda. Especially marriage to the sort of women to whom the adviser is referring. This cartoon is part of a series about the phenomenon of gurus, personal counsellors, lifestyle coaches (a recent and rather ludicrous twist on the phenomenon of personal fulfilment), motivational speakers and suchlike. In the series the guru, counsellor or what-have-you is a very ordinary middle aged woman rather than someone who is removed from the humdrum of everyday life. The speaker is meant to represent to some extent a parody of lifestyle advisers and self improvement gurus. Cartoon about matchmaking, attractive women, marriageable women, marriage guidance, never marry a pretty woman, wisdom, counselling, engagement in society. A drawing of a kissing couple. The couple’s heads are jigsaw pieces which fit together perfectly when they kiss. A drawing about love and romance. It’s a romantic drawing which I’m showing because it’s Valentine’s Day soon. The drawing works as a Valentines Day cartoon, or as a piece of surrealist artwork. It’s a Valentine cartoon or an illustration about love, showing a romantic couple who are ‘made for each other’ because they fit together like pieces of a jigsaw. 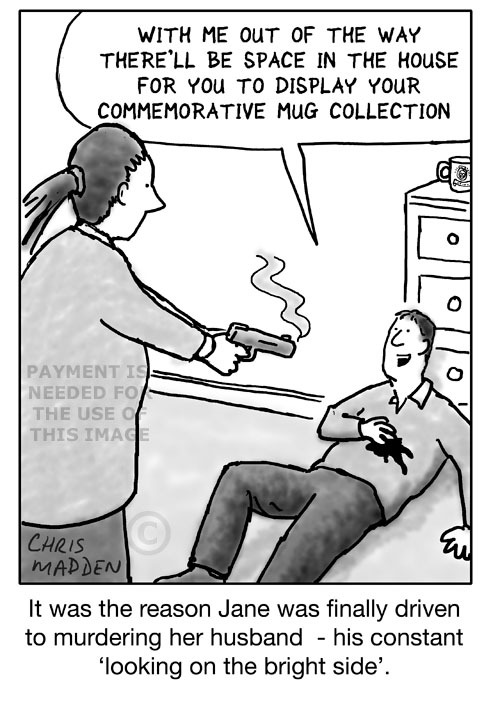 A cartoon about compromise and consensus. A cartoon showing two people disagreeing. They want to compromise (or at least one of them does), but the gulf between them is too great. There is no meeting point possible. The thing that the two people disagree about could be anything from a domestic issue, an emotional issue, a relationship issue, a political issue, a pay negotiation – any sort of problem really. A cartoon about compromise, consensus, diplomacy, shifting your position, negotiating, therapy, counselling, psychotherapy, arbitration, negotiation. Cartoon showing a bow and arrow. The arrow is walking away from the bow. The bow is telling the arrow that separately they are nothing but together they can conquer the world. The bow and arrow in this cartoon are a metaphor for teamwork. Neither member of the team can function to their full potential (or in this case, at all) without the other team member. A cartoon about teams and teamwork, relationships, interdependence, teams, teamwork, symbiosis, management skills, facilitation, achieving potential. Cartoon showing a bow and arrow. The arrow is walking away from the bow. 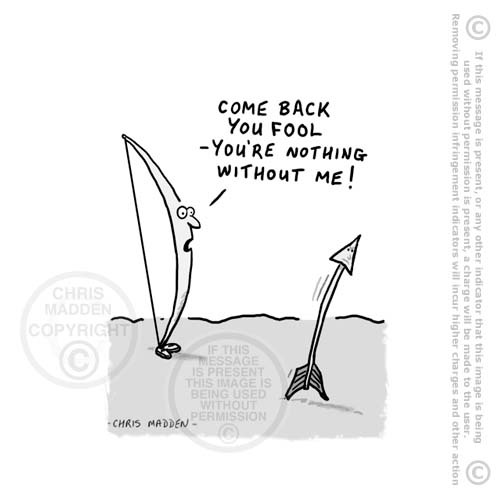 The bow is saying to the arrow “Come back – you’re nothing without me!”. The bow could represent a facilitator, an agent, a manager, an impresario, a partner, a muse. A cartoon about teams and teamwork, relationships, interdependence, teams, teamwork, symbiosis, management skills, facilitation. 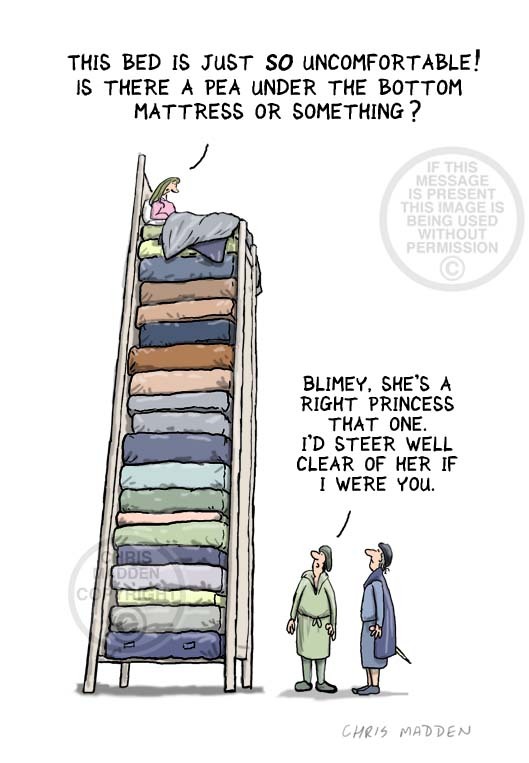 A cartoon showing the fairy tale of the princess and the pea. 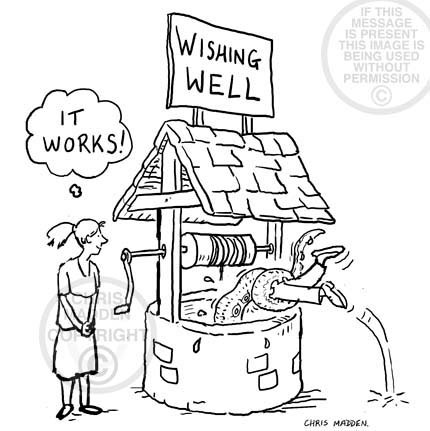 A couple standing near a wishing well. A monsterous tentacle appears out of the well and pulls the man down the well. The woman thinks “It worked!”.